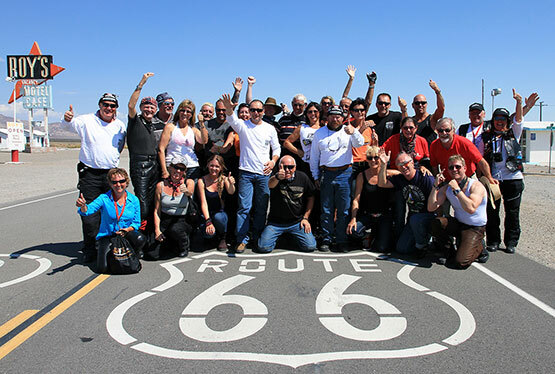 A real "Dream Tour" is our 15-day Route 66 Semi Guided motorcycle tour, where you will be cruising on and along the legendary mother road Route 66. 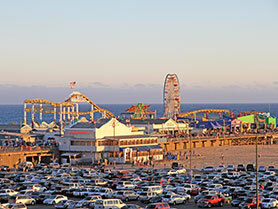 This road trip combines the best parts of Route 66 with popular highlights along the route. Discover the great freedom on the endless highways of the American west. Visit fascinating natural wonders like the Grand Canyon, Monument Valley with its bizarre rock formations, and the Petrified Forest. During the Route 66 motorcycle tour, cozy biker bars and owner-managed restaurants with delicious American specialties await you. Get to know the culture of the Native Americans for one night at a Navajo reservation, and try your luck at one of the casinos in the glittering metropolis of Las Vegas. 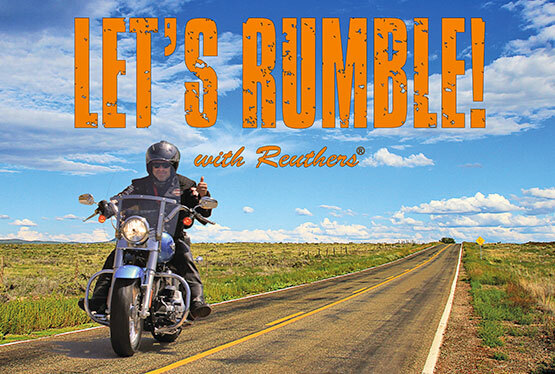 This Route 66 Semi Guided motorcycle tour by Reuthers fulfills all your dreams! 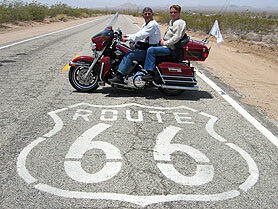 Early in the morning you will pick up your motorcycle at the rental station and start your Route 66 adventure. 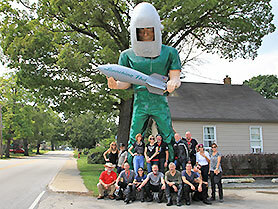 Around midday you will reach Wilmington with the Gemini Giant, a large fiberglass figure of the 1960's era. After an obligatory stop at the Dixie Truckers Home, you will end your first day in Spingfield/Illinois, which was for many years the chosen home city of Abraham Lincoln, the president of the United States during the civil war. 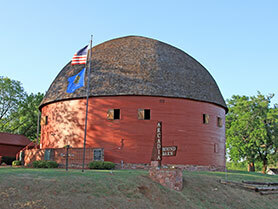 Today is dedicated to the "Gateway to the West": the pioneer town St. Louis. 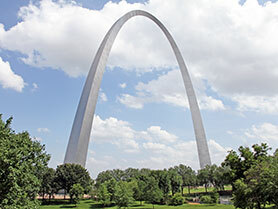 The town's landmark is the more than 190 m high steel Gateway Arch. 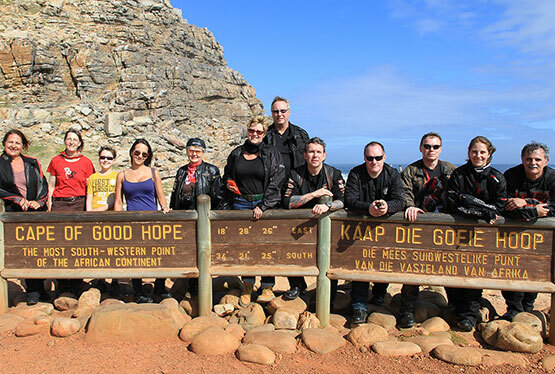 Inside, you will take trams to an observation platform to the top of the highest monument of the nation. The afternoon in St. Louis is to relax, for dinner we recommend downtown Lakelade's Landing. You deliberately want to do without the unnecessary challenges of confusing streets in the city, bad road conditions and misleading signs to the "Mother Road". 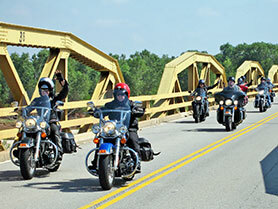 You will travel some distances of the tour on the Route 66 and others on the Interstate. 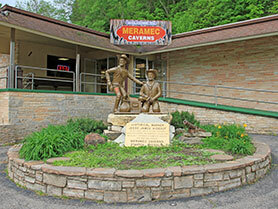 Today's highlight and absolute must are the Meramec Caverns. The famous limestone caves have been a tourist classic since the beginning of the Route 66 and served the outlaw Jesse James as a welcome hiding place from his pursuers. You will start your day with a real photo highlight: A bridge with 38(!) huge arches spanning the Canadian River. And the Route 66 museum in Clinton that you will visit is a memorial that is different to all others: each room is dedicated to a decade of the "Main Street of America". A further highlight on your tour is the next stop and overnight stay at the Big Texan Steak Ranch in Amarillo. 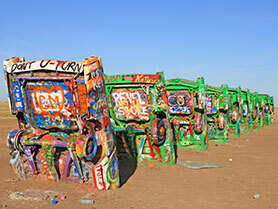 You continue your adventure tour on the Route 66 to the legendary Cadillac Ranch. As a reminder of the golden days of the Route 66 ten Cadillac's are buried vertically into the ground. Next stop is Adrian, the geo-mathematical center of the old Route 66. This is as important as crossing the equator. Brunch at Russell's Travel Center with its world class Car Museum rounds up the morning. 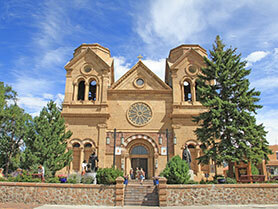 At the end of your eventful day, you will spend the night in historic Santa Fe. This morning you check out the original film location of Maggie's Diner from the cult movie "Wild Hogs" with John Travolta in Madrid. After taking a memory picture your tour takes you past Mesas, cottonwood trees and continues on the gentle winding road to Laguna Pueblo where the Spaniards built the mission church, which you will visit. Just in time for dinner, you will reach the hotel El Rancho in Gallup after riding several more beautiful miles through Indian Territory. The heydays are gone, but there once was a time when famous Hollywood stars met up here. Ronald Reagan slept in room 103; Humphrey Bogart in room 213, Doris Day in room 109, Kirk Douglas stayed in 105, Gregory Peck in 111. The Marx brothers resided in room 118, John Wayne recovered in room 100 after a long days ride and for Hermann the German room 101 is regularly reserved for the night. After a hearty breakfast in the "El Rancho" you will drive the former Route 666 to the North, straight through Navajo country. After some 95 appealing miles, you will arrive after passing through Shiprock and Teec Nos Pos to the Four Corners, the single point in the United States, where the boundaries of four states come together: Colorado, Utah, New Mexico and Arizona. 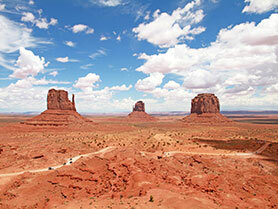 Another highlight on this motorcycle tour is Monument Valley. You will spend the night appropriately in the Navajo reservation near the Canyon de Chelly in Chinle. Starting off in Chinle, the first stage leads you to the Petrified Forest National Park and the Painted Desert. The more interesting of the two natural wonders is the Petrified Forest, which was formed millions of years ago by a freak of nature. The northern part of the park, the Painted Desert, consists of sedimentary rocks that change color depending on the exposure to the sun going from red to orange to purple. 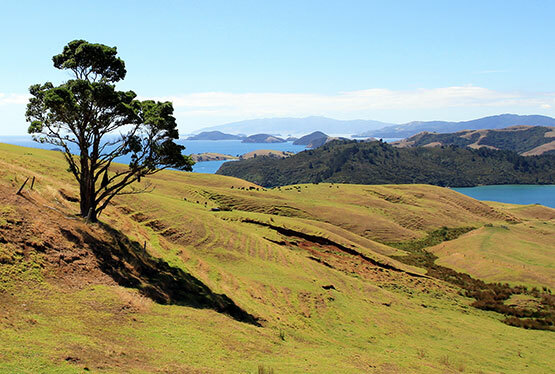 On your journey towards the west ("Go West", is your phrase of the day! 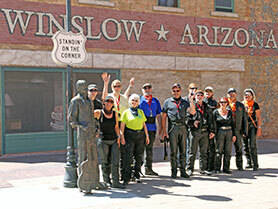 ), you will pass the Wigwam Motel in Holbrook and cruise on to Winslow, Arizona to Winslow Corner, known from the song by the Eagles. Today's destination is Flagstaff which is located between the two Indian reservations of the Navajo and Hopi on the legendary Route 66. You will end the evening at the Museum Club that the locals call "The Zoo" and which is probably the best dance club between Oklahoma City and Los Angeles. 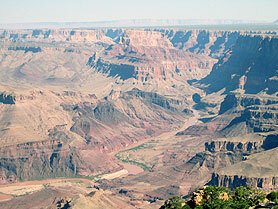 Today's highlight is the gigantic Grand Canyon - if you wish, enjoy a spectacular helicopter flight. 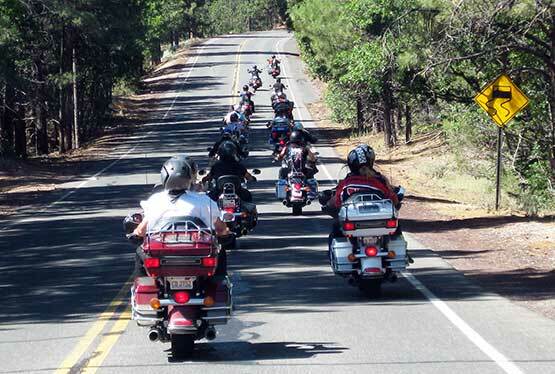 After lunch you will cruise over Williams to Seligman. 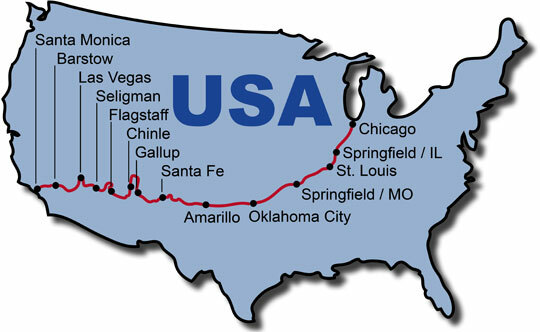 Here the long loop of the old Route 66 begins right up to the Californian border. 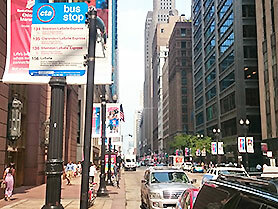 Even the very old street layout is navigable along this beautiful section. Arriving in Seligman, you will first visit the founder of the "Historic Route 66 Association" at the Route 66 Visitors Center. You will certainly have the opportunity to meet the "Guardian Angel", Angel Delgadillo and perhaps you might be in the mood to receive one of his famous barber shaves. 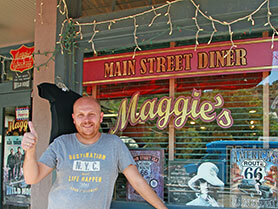 By the way, in his barber shop, you can find many Route 66 souvenirs - a true paradise for bargain hunters. In the evening you will set up your sleeping quarters at a typical Route 66 motel in order to get to know something very simple and rustic. You will have breakfast today at Westside Lilo's Cafe, an original 66 restaurant owned by an expatriate German, who ensures that all the guests in Seligman are well fed. Through Kingman you continue on to Las Vegas / Nevada and directly on to the Las Vegas Boulevard. 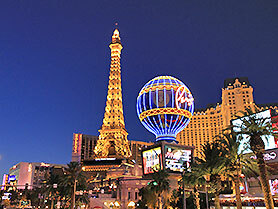 The accommodation is booked in the legendary The Mirage which is an ideal starting point for a stroll right on the Strip. Do whatever your heart desires: dine in the Hard Rock Cafe, visit one of the many world-class shows or dive into the nightlife of the city, the afternoon and evening are at your disposal. After a long night, you will start today your "Desert Tour". 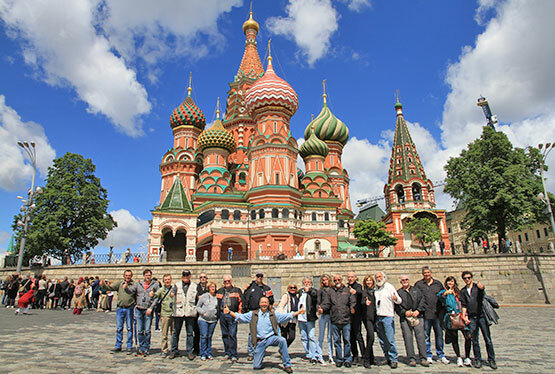 You will roll past exclusive hotels on the last leg of the Las Vegas Boulevard, and then head off to your day trip in the direction of Barstow. From Needles, California you head back to Route 66, many refer to this as being the most beautiful part of the route. Other stops are the Sahara Oasis and Roy's Cafe in Amboy. Before you arrive in Barstow you will turn a few miles north - if time allows it - to visit an old silver mine in the Mojave Desert in the ghost town of Calico. In the still inhabited and lovingly renovated original Western town over a thousand adventurers once sought their fortune. If you want to you can pick up your very own personal Western photo. A beautiful day and a beautiful trip ends in Barstow. By the way in 1886, the town was named after the president of the Santa Fe railroad company. Barstow also managed to end up in the refrain of the Route 66 classic "Get your kicks".